It was her turn for a question, and that’s what she asked. We were in Armenia at a private press briefing with three of the most powerful philanthropists in the world, and she used her question to ask where George Clooney was. The moderator politely reminded her that there were esteemed panelists in attendance, and we should take advantage of the opportunity to learn from their expertise. The moderator was right. There was a lot to learn. Ruben Vardayan was one of these three men. Of Armenian descent, he cofounded the Aurora Prize for Awakening Humanity, an award granted to a humanitarian effort that changes the world. Cool, I thought. Mr. Vardayan is doing good work. Little did I know how much this one man has accomplished in his lifetime, until several months later. Fast forward five months, and I was in a cafe in Russia at the Moscow School of Management SKOLKOVO watching him. I observed him for 45 minutes. I was set to have a meeting with him at 9 am, and I arrived early. He was in another meeting. He was engaged. Many people came to his table. He hugged them, or shook their hands. He smiled and was gracious. People were excited to see him. I was with his assistant. She looked at him and said, “he is such a good man.” If you really want to know about a person, ask their assistant. She had great things to say. I could tell she was being honest. I got one hour with Mr. Vardayan, and wrote as much as I could. He quickly ran me through some of his most proud professional achievements. He led Russia’s first investment bank, Troika Dialog. Together with his wife, he co-founded the United World College (UWC) Dilijan in Armenia. He invests in companies all over the world. Alongside with his wife, Veronika Zonabend, he founded RVVZ Foundation, a non-profit organization that focuses on global education, territory development, and the advancement of social entrepreneurship and Philanthropy infrastructure in post-Soviet countries. He also founded IDeA, Initiatives for the Development of Armenia, which is yet another charitable foundation. They are restoring historical landscapes, among other things. 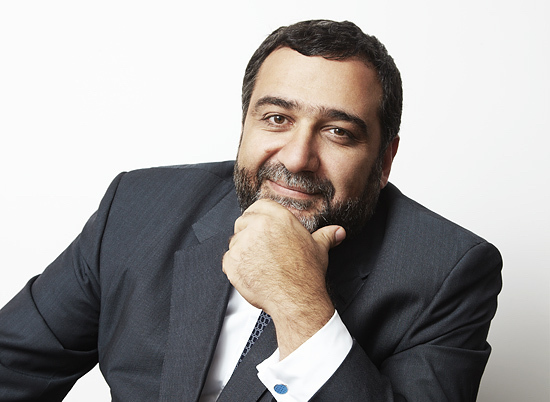 He is the President of LLC Vardanyan, Broitman and partners. The list goes on and on. I could spend this article talking about his achievements, but I wanted to dig deeper than his impressive resume. I wanted to know more about his mind. I wanted to know more about his work and vision beyond the biography and highlights. I needed another day, but in one hour, here is what I learned about this global leader and big thinker. You have the power to change a country. Ruben is literally rebuilding the Armenian economy with his leadership. His foundation is currently active in several projects. For example, they are restoring a monastery in Tatev, Armenia. This historical monument attracts tourists. But Ruben did not stop there, because he realized that people need to get to the monastery, so he built the cable leading to the monastery. This was a smart move. The amount of tourists went from 4,000 every year to more than 150,000 visitors a couple of years later. This restoration idea led to several millions of dollars in revenue. It led to more jobs. They also reinvested millions of those dollars into a women’s resource and empowerment center. In Dilijan, Ruben and his wife Veronika built the United World College Dilijan. This put Armenia on the map for many different international students. The students appreciate Armenia and share their respect with their peers when they return home. It represents a regional movement, because it was the first UWC school in Eastern Europe. The students start innovative and service driven projects. They go to orphanages, they create socially conscious projects like Re-apaga which recycles electronic waste, and so the cycle of rebuilding continues. You have the power to change a region. Ruben did not stop with Armenia. He is also hyperfocused in Russia. In 2006, he cofounded the Moscow School of Management SKOLKOVO. This was Russia’s first private business school, and has graduated over 12,000 students in the last 10 years. He also created a company, Phoenix Advisors, which advises individuals and families on with their transition of wealth. Whether it’s the creation of a new or a structural change to their existing business, the decision to devote himself to philanthropy, family or just to a hobby, Phoenix Advisors is a trusted place to turn to navigate the complex world of wealth creation and transition. Finally, he created a philanthropy infrastructure, which increases the level of transparency and the effectiveness of charity funds to restore benefactors’ confidence in the sector. PHILIN (Philanthropy Infrastructure) is the project aimed at the professionalization of the charity industry in Russia. Forget trends, humans are the future. When I asked Ruben about future trends he is most excited about, his answer had nothing to do with technologies or products. “People are the future, and human development is the most important part of changing the world. We have moved from an industrial empire into an intellectual empire. In the intellectual empire, humans are the main capital for the future. There are a small percentage of the people who are changing the world, so I invest in them,” he told me. When identifying good people to invest in, Ruben has found several characteristics they share. The person needs to be curious and ready to learn with open eyes. They have a long-term view, and a willingness to get out of their comfort zone. They have a global mission. They are global citizens with local identification. Finally, they are adaptable in a fast changing world, while holding their values steady. Ruben credits his ability to get things done to discipline, persistence, and the past. Ruben told me that if you want to know what will happen in the future, study the past. When the Soviet Union collapsed, he knew there would be opportunities in finance and investing. So he focused on what he needed to do to be the best investment banker. He worked in an investment bank, and then another. He learned from other countries who had implemented similar best practices that worked. Then he followed these case studies. He stayed consistent, and looked for what worked in the past. Then he implemented it in the future with success. Ruben takes his time with deals, relationships, projects. He sits with people, hears their stories, wants to know them. He accredits much of his success to his mentors. He also mentors a lot of people. But mentorship is often misunderstood, he told me. Mentorship is not like a coach or teacher that sits you down in a class and says, “Now it is time to learn, or now it’s time to exercise.” Mentorship is not so transactional. It takes time and trust. Often times, you don’t even realize your mentor is your mentor until years or decades later, and mentorship is not a one-way street. If you are not teaching your mentor as much as they are teaching you, it’s not a sustainable relationship. Trust can be measured by this simple test. If you want to see how much people trust you, see how much money can you borrow from friends and family without a contract. If you can borrow a lot, you have successful trust relationships. I asked Ruben what he’d be working on next. He told me that 25 years from now, he will make strides in global education. He will bring back respect to teachers and fix the business model of education. He will focus on territory development and implement more projects similar to the monastery conservation which will bring economic growth and job creation, just to name a few of his many projects. I asked Ruben if he works nonstop, or any other tips he has to achieving so many things? Next, he told me to be honest with yourself. It is better than being rich, powerful, or famous. As we concluded our interview, Ruben’s wife and daughter came to our table. He hugged them.